Form is available at Council offices or can be downloaded here. Fees will be advised when lodging your application. Please contact Council if you wish to know which fees will apply beforehand. 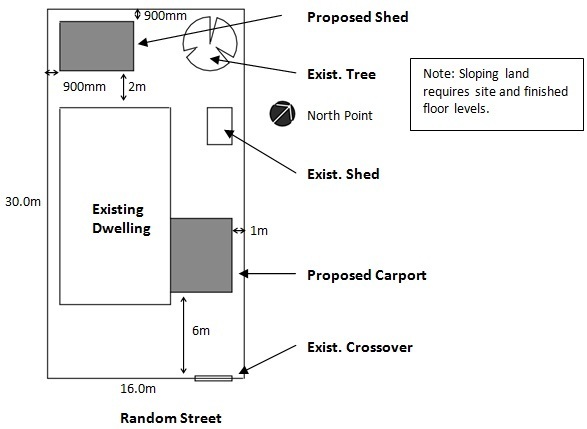 Boundaries and dimensions of the entire site as per the current Certificate of Title. Location and dimensions of any easements on the land (the Certificate of Title will show whether any easements that apply to your land). Location of proposed structure on the land. Location and use of all existing buildings (i.e. dwelling, sheds). Distance between the proposed structure and other structures on and, and distances to the site’s boundaries (if not built on boundary). 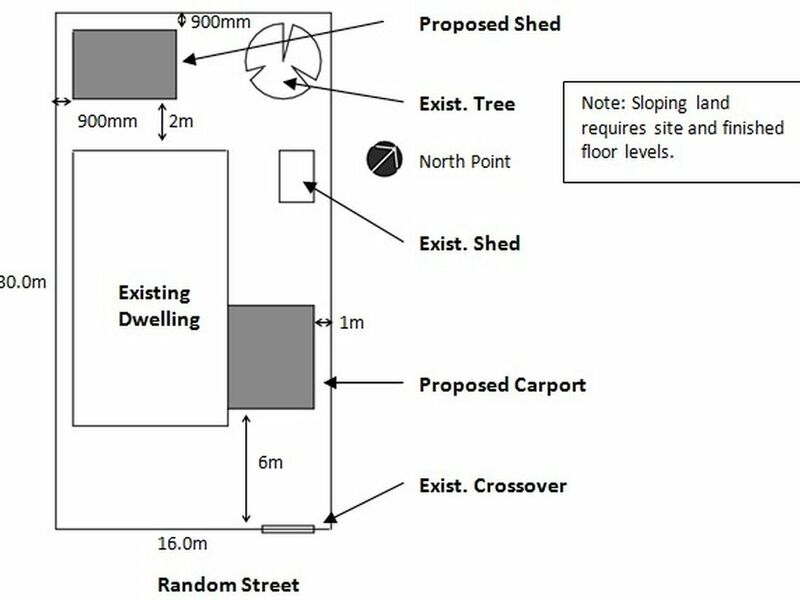 Location of any Significant or Regulated Trees on the site or adjoining land, which could potentially be affected by, or affect the works. All elevations of the proposed structure (lengthways and widthways). The dimensioned overall height of the proposed structure. A sectional drawing of the structure showing in detail how the structure is fixed to the foundation (soil) and also how it is to be attached to other buildings in more detail. The materials, finishes and colours of the proposed structure. Structures will require a completed Roof Framing Checklist with their application. 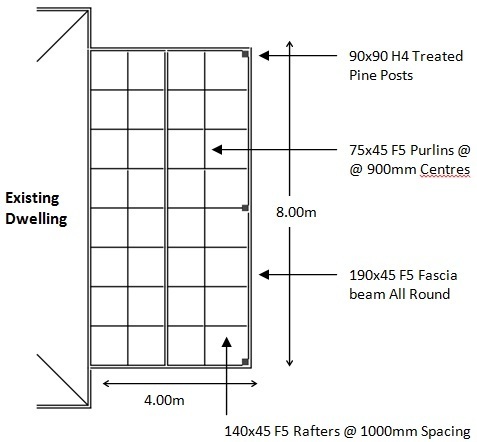 The checklist is available here - Schedule 5 Roof Framing Checklist. 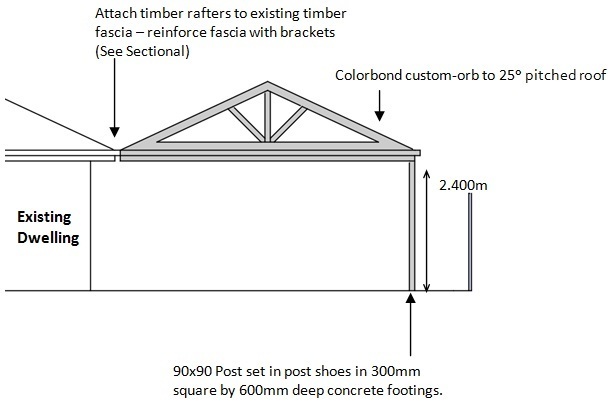 Applications for pitch timber pergolas can be dealt with using the Timber Framing Code. 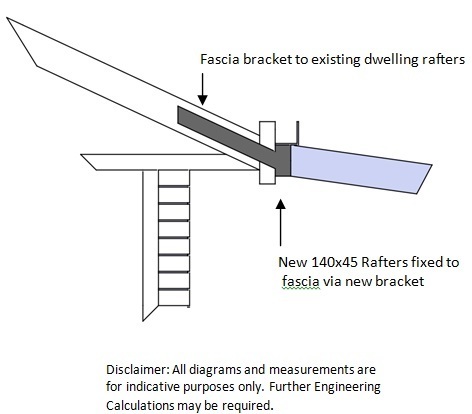 Steel framing pitched roof pergolas need to have an engineer’s calculations to test the steel member sizes and to also specify the connection details. Those plans which are received with no calculations will not be approved until calculations have been provided. If you are constructing a building using standard building specifications (e.g. Olympic Garages, Stratco carports and verandahs), a copy of the specification related to the job should be attached to the applications. These ‘standard’ designs use specific connection and footing details which need to be adhered to during construction. For ‘non-standard’ designs (i.e. using your own design), a Certificate of Structural Adequacy from a structural engineer will need to be provided with your application.